Glasgow Warriors head coach Gregor Townsend says his side must put together an 80-minute performance to break their three-game losing run. Glasgow followed derby losses to Edinburgh with a 34-10 European Champions Cup defeat by Racing 92. 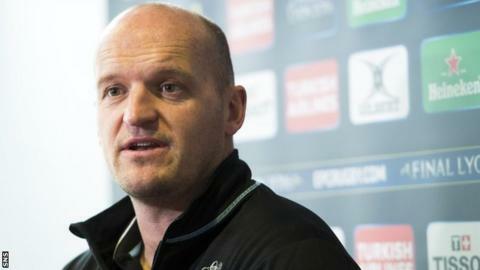 "I'm much happier after today than I was after that first match [against Edinburgh]," said Townsend. "I thought the pack were outstanding today. But as a team we're not putting it together for 80 minutes." After losing in Paris, Glasgow now sit eight points behind leaders Racing in Pool 3 with two games to go although Townsend is failing to give up on qualifying for a first-ever quarter-final for his side with the three best runners-up joining the five group winners in the knock-out stages. The Pro12 champions visit Northampton Saints next Sunday. "We've got to be better than we were today," Townsend told BBC Scotland. "If we give Northampton as many balls to attack then they will score too. But we're still very positive that if we were to record two wins we're in with a shout of making the quarter-finals." Glasgow started the second half 13-3 down but a try three minutes after the restart from Racing captain Dimitri Szarzewski proved a turning point in the match according to Townsend. "We were really disappointed with the scoreline at half-time," he said. "We felt it should've been the other way around, we created a couple of good opportunities and we felt we weren't getting the decisions from the referee in that first half. "We looked solid in the scrum, we looked really good defensively but we did give Racing too many turnovers, which just allowed them to get in behind us. It's very hard to defend off turnover ball and we gave a fair number away today. "The way we started the second half was where we lost the game."